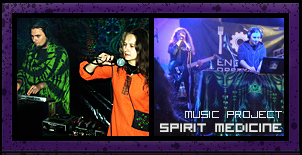 Psytrance/post-industrial music project "Spirit Medicine"
Psy-visionaristic art project "Hyper Icons"
Spirit Medicine crew consisting of two musicians and artists – Maria "MZ" and Albert "Alexxdrum". 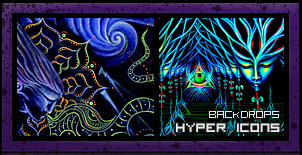 We are engaged in a variety of things related to the psychedelic subculture and underground culture - we do experimental trance-industrial music material as studio and live project "Spirit Medicine", and also we create a wide fluorescent backdrops as part of our artistic and conceptual project "Hyper Icons" which we use as a decoration parties and festivals. If you want to invite us to participate in some events – plz review all the materials that we have presented on this site and contact us, we will be glad to cooperate and participate! Pax - Shanti - Peace - ShalOm!